Heat Sink conduction through Aluminum & Copper(Skived/Extrusion/Heatpipe Assembly/Thermal module…etc.) The thermal conductivity of the heatsink(Skived/Extrusion/Heatpipe Assembly/Thermal Module) material has a major impact on cooling performance. Heatsink thermal conductivity is measured in W/mK; higher values mean better conductivity. Heat convection through AC Fan/DC Fan/EC Fan/ Blower.Forced convection is a type of heat transfer in which an external sourceb (AC Fan/DC Fan/EC Fan/Blower) is used to generate fluid motion and increase the heat transfer. The most common perception is that higher the flow, higher the forced convection, as the result, higher the cooling. A Heatsink (aka Skived Heatsink/Extrusion Heatsink/Heatpipe Assembly/Thermal Module) is an object that transfers and dissipates heat. Heatsinks are used in a wide range of applications, ex.-information equipment, manufacturing equipment, appliance apparatus, lighting equipment, medical equipment, telecommunication equipment and network equipment, and etc. 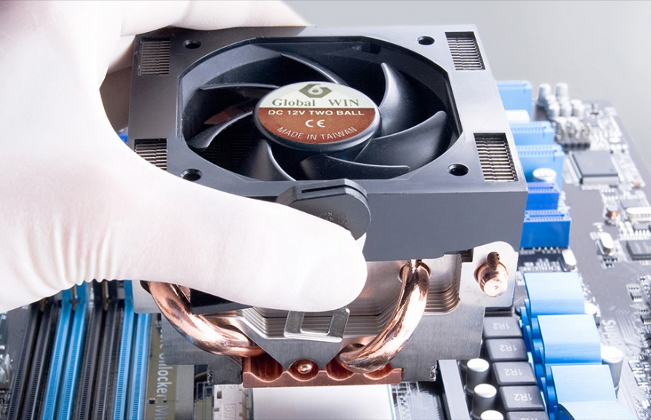 What is the Heatsink performance specification? The performance specification for any Heatsink would be thermal resistance or thermal sensitivity, which is typically expressed in C° / W as the temperature increases per watt of heat. Alloy Heatsinks have lower thermal conductivity than pure metals, but may have better mechanical or chemical (corrosion) properties. Aluminum Heatsink – The thermal conductivity is 205W/mK, the aluminum heatsink is inexpensive compared with Copper, due to its softness, it could be milled quickly, also the weight is light, thus the Aluminum Heatsink will put less weight on its mounting. Copper Heatsink – Copper thermal conductivity is about twice as high as Aluminum(400W/mK), hence the Copper Heatsink is an excellent thermal conductive material for heatsinks. The disadvantages are heavy & high price. Stampings Copper or aluminium sheet metals are stamped into desired shapes. They are used in traditional air cooling of electronic components and offer a low cost solution to low density thermal problems. They are suitable for high volume production, because advanced tooling with high speed stamping lowers costs. Additional labour-saving options such as clips and dry interface materials can be factory applied to help to reduce the board assembly costs. Extrusions These are by far the most common for power amplifiers, and allow the formation of elaborate two-dimensional shapes capable of dissipating large heat loads. They may be cut, machined, and options added. Cross-cutting will produce omni-directional, rectangular pin fin heat sinks, and incorporating serrated fins improves the performance by approximately 10 to 20%. Extrusion limits, such as the fin height-to-gap ratio and fin thickness, usually dictate the flexibility in design options. Typical fin height-to-gap aspect ratio of up to 6:1 and a minimum fin thickness of about 1.3mm are attainable with standard extrusion processes. Bonded / Fabricated Fins Most air cooled heat sinks are convection limited, and the overall thermal performance of an air cooled heat sink can often be improved significantly if more surface area can be exposed to the air stream. Such high performance heat sinks utilise thermally conductive aluminium-filled epoxy to bond planar fins onto a grooved extrusion base plate. This process allows for a much greater fin height-to-gap aspect ratio of 20 to 40, with the intent of greatly increasing the cooling capacity without increasing volume requirements. Very tall fins don't always work. Castings Sand, lost core and die casting processes are available with or without vacuum assistance, in aluminium or (less frequently for audio applications) copper/bronze. This technology is used in high density pin fin heat sinks which provide maximum performance when using forced air cooling. Folded Fins Corrugated sheet metal - either aluminium or copper, increases surface area and, hence the volumetric performance. The heat sink is then attached to either a base plate or directly to the heating surface via epoxying or brazing. It is not suitable for high profile heat sinks, but it allows high performance heat sinks to be fabricated for specific applications. Extrusion Heatsink: The Extrusion Heatsink are most common solution in market so far. The Extrusion Heatsink may be cut, machined, CNC and options added. There are limits for Extrusion Heatsink, such as high-to-gap ratio and fin thickness. Stamped Heatsink: The maching process for skived fin heatsink uses cutting tools and a controlled slicing technique to manufacture heatsink from a solid block of aluminum or copper. The benefits are thinner blades, bigger heat dissipate area than extrusion heatsink. Stamped Heatsink: The Stamped Heatsink are manufactured by the application of extreme pressure to a piece of aluminum or copper to produce fins of the desired height, thickness and shape, which are then bonded to the heatsink metal base. Die-Cast Heatsink: The Die-Cast heatsink are manufactured by forcing liquid aluminum under high pressure into re-usable steel molds. This is an ideal solution when you require a more complex design in high volumn and with lower thermal conductitivy. Precision Machine/CNC process: Through the Precision Maching/CNC process utilizes the latest multi-axis CNC center, lathe, EDM and grinding machine to provide you compelex and high precision heatsink to a high tolerace. Most precision machine/CNC process will have no problem holding a tolerance of 0.002” or 0.005MM. Heatpipe Assembly: Heatpipe are usually sintered or powered copper, and could be manufacturered under any type of orientation including horizontal, gravity aded or against gravity.The Heatpipe Assembly allows for great potential to increase your thermal performance. Die-Cast Heatsink - Manufactured by forcing liquid aluminum under high pressure into re-usable steel molds. This is an ideal solution when you require a more complex design in high volumn and with lower thermal conductitivy. Determine the fan(AC Fan/DC Fan/EC Fan/Blower) specification While checking a heatsink, it is also important to determine the rate of fan(AC Fan/DC Fan/EC Fan/Blower). High air flow & air pressure are not definitely better performance, all the mechanical design/air convection & air conduction shall be considered.